You’ll probably find me with a book in one hand and Krispy Kreme in the other. The dream long held by many Muslim — and especially Desi — parents: to become a doctor, or engineer, to marry well into a stable family, and to live a comfortable, happy life. It’s far from disappointing. In fact, it's an ideal life. Looking around at my community, almost every second person is a doctor, or currently in medical school. In our parent's eyes, it is the epitome of the American dream. However, many Muslim parents tend to discourage their children from entering the Arts. There is a force, one that is one of the backbones of this country. And that is the media. And we tend to ignore it. Sure, we watch it, complain about it, talk about the bad image it is creating of us Muslims. But when have we ever ourselves taken advantage of this powerful tool, one that has the power to change the tides of a nation? The collateral damage of 9/11 included bigotry towards Muslims. Suddenly, all of us were asked to answer for the actions of a few; we were thrust into the spotlight, glared upon by millions. Yet, we never spoke into the microphone. Instead, others spoke for us and about us, while we watched. We complain about Islamophobes, about Fox News, about discrimination against us. And these complaints aren’t unwarranted — according to ISPU, over 80% of television media of Muslims is negative. Yet change comes from action itself. So why do we discourage our children from entering fields such as entertainment, media, business, art, and beyond? Fortunately, Muslims have started to bring their voices into mainstream media. In fact, a famous example of a Muslim in the media is Hasan Minhaj. Minhaj is an American-Indian Muslim stand up comedian, famous for his role in the Daily Show, Homecoming King, White House correspondents dinner and now, his newest show, Patriot Act. In his show Homecoming King, he explores and talks about his experience as a second generation Indian through comedy. He has become a huge and valuable voice for the Muslim community, while still being funny and relatable to all, and has inspired many to follow his footsteps and enter the entertainment media. Hasan Minhaj didn’t become a doctor, a lawyer, or an engineer — and that proved to be incredible for us. Another organization strives to bring accurate Muslim voices and representation into Hollywood. United Productions Foundation, a non-profit organization aimed at creating peace through the media, has produced many films and has worked on famous shows — such as Bones, with its Iranian Muslim doctor, Arastoo Vaziri, and even the Simpsons, on its “MyPods and Broomsticks” episode. With these inclusions, stereotypes against Muslims were brought into question and positive images of Muslims were shown. With an estimated 150 million viewings of its films and an 83% indication of positive feedback after film viewings, UPF is making a way for a white-washed Hollywood to begin to include the long-needed voices of Muslims. 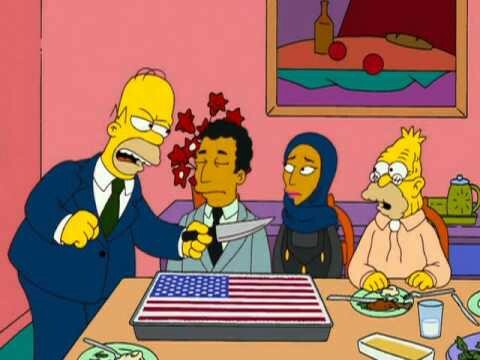 Simpsons shattered stereotypes of Muslims through satire and comedy. The high-end fashion industry is also a calling for many Muslims. Halima Aden is the first hijabi Muslim model and is signed to IMG Models — the same company that represents Gigi Hadid and Chanel Iman. She has been featured on Elle, Teen Vogue, Vogue Arabia, Allure and Glamour, and has walked for the likes of Max Mara, Kanye West’s Yeezy season 3, and Marc Jacobs. Along with her modeling, she frequently speaks out about the need for Muslims in fashion and has inspired many young Muslim females and males to make their way into the fashion sphere. However, we are far from perfect. We need more Muslim painters, Muslim artists, Muslim actors, Muslim comedians, Muslim athletes, and Muslim activists. At a time where Muslims are finally beginning to take their place in the political and media spotlight, the rest of us should not sit back and watch. Our Muslim youth is brimming with raw talent and potential — it would be tragic if we let this go to waste. In the words of the pioneering Shirley Chisholm: “If you don’t have a seat at the table, bring a folding chair.” It is high time Muslims take out their folding chairs — and take the microphone back.